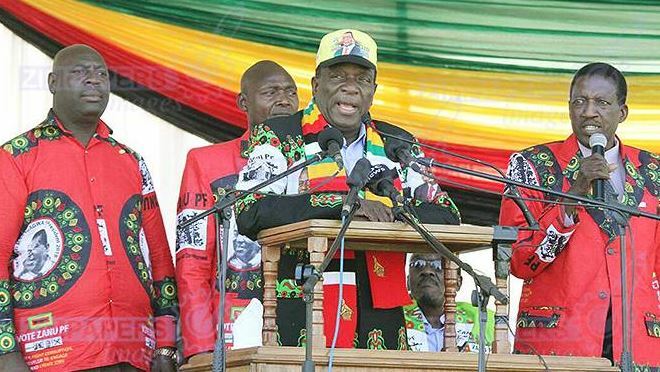 Zimbabwe President Emmerson Mnangagwa has been bombed while at campaign rally in Bulawayo city. A close look at an amateur video footage shows the president raising his hands while walking away from the podium waving to his supporters. The President is vividly swammed by the Vice presidents, government ministers and escorted by highly armed security detail. As he walked down from the 2-steps podium, a bomb exploded, sending thick plumes of smoke and debris high into the air. The fate of the president is not yet known, but some reports have already claimed that the head of state is safe at state house. “There have been multiple attempts on the President’s life over the past five years,” Presidential spokesman George Charamba said. Vice President Kembo Mohadi suffered leg injuries in the bomb blast. Minister of Water, Environment and Climate Oppah Muchinguri-Kashiri was also injured. The two senior Government officials are admitted at a local hospital ( name withheld.) Local newspaper authoritatively reported that several security personnel attached to VIPs are also injured. President Mnangagwa has visited the injured in hospital who include VP Mohadi. BELOW IS A SHARED VIDEO ON TWITTER, BUT TAARIFA CANNOT CONFIRM IT’S AUTHENTICITY.